Learning how to catch Cobia is one of the most rewarding things to do in fishing. Cobia are one of the most popular fish that we have on the East Coast. Not only popular for there size but what makes these fish so exciting to catch is the variety of techniques you can use to catch them. Many of the common ways to target Cobia are Chumming and Sight Fishing. Here on Finao Sportfishing Cobia fishing charters our most common way we catch them are by Sight Fishing. We will go over step by step on how to catch Cobia Sight Fishing. If you are not familiar with Sight Fishing please click the video below to view a Cobia Sight Fishing Video on Finao Sportfishing. One of the most important things to know when Cobia fishing is the time of year to target them. Here in Virginia when the water temperature reaches about 68 degrees Cobia have already arrived. This temperature usually begins 2cnd to 3rd week of May. Cobia will stay in Virginia usually until the first week of October. When the water temperature drops into the 60s they begin to migrate South for the Winter. The best time to fish for Cobia if you are sight fishing is when the sun is at its brightest / highest. When looking for these fish on the surface it is difficult to see them early in the morning and in the evening. The lower the sun is on the horizon the more glare will be put onto the surface of the water. We normally leave for our Cobia fishing charters at around 10 am and fish until 3pm giving us the best visibility that day. A very important thing to factor in when sight fishing for Cobia is the clouds. When it is cloudy it makes it very difficult to spot fish since the clouds increase the glare on the water. Before getting into Rods, Reels, and Line used for Cobia fishing it is important to have the right Cobia fishing equipment to help you land your fish. We always keep a large landing net on board with us for when we are catching and releasing these fish. The net makes sure that the Cobia gets boated safely so he can swim away unharmed to fight another day! Watch the video below to learn more about netting Cobia. 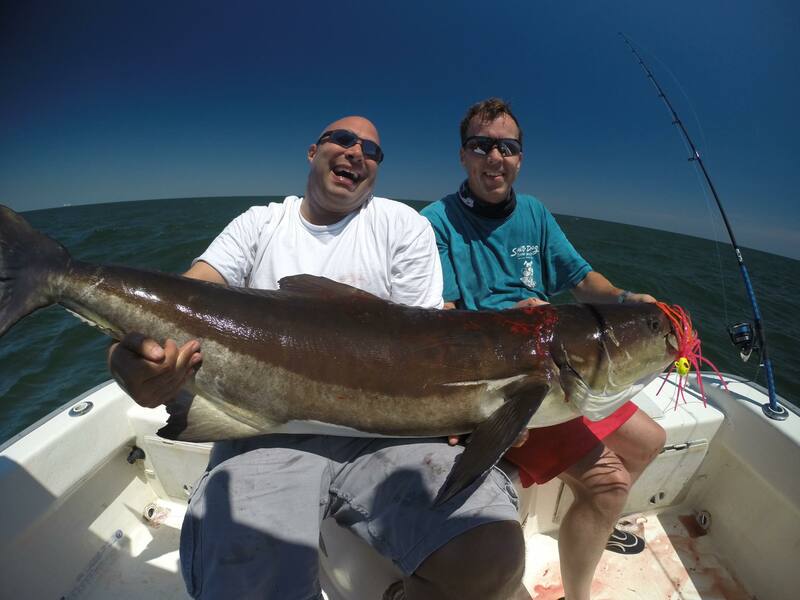 Using a Gaff for these fish is recommended for the bigger Cobia. A 6 foot Afto Gaff with a 4 inch hook is what we use when harvesting these fish. Netting a big Cobia can be difficult to do compared to gaffing one. All states have different laws about gaffing fish so be sure you are up to date with the fishing regulations / laws before doing so. Watch the video below to see Finao Sportfishing Gaff a big Cobia! There are many Cobia fishing Rod and Reel on the market but we use top of the line equipment on Finao Sportfishing to ensure our best chances to catch the fish of a lifetime. The Cobia fishing rod and reel that we use when sight fishing are Saltist 4500 Spinning reels on Ugly Stik Tiger rods. Just as important as the Rod and Reel you are using is the fishing line and hooks. The line that we recommend to use is 65# Power Pro Braided line. The advantages to using braided line over your common mono filament fishing lines is that braided line is more durable, stronger, and thinner than standard fishing line. Another important thing to remember is a good hook. We recommend using Owner 10/0 J hooks. To view more on Rod, Reels, and equipment about Cobia fishing click the video below! Now that we have talked about the gear and time of year lets get into Cobia fishing lures. As most of you know there are hundreds of thousands of different lures on the market but what makes a “good” Cobia fishing lure? Our most commonly used Cobia fishing lures on Finao Sportfishing are bucktails. Bucktails come in many different colors and sizes. What is most important in the bucktail is the hook and size of the bucktail. We recommend using a bright color lure like pink, green, or orange. As for the sizes of the lure 2 – 3 ounces is a good size for all sizes of Cobia. The hook is probably the most important part to remember when choosing the right Cobia fishing lure. A strong big hook is needed for these powerful fish. To view and learn more on different Cobia Bucktails Click the Video Below! Another important thing that every Cobia fisherman needs to know is the proper live bait for Cobia. There are many different live baits that can be used but the best we believe are Eels and Croaker. These two live baits are strong so they stay alive best. When using live bait it is important to make sure that your bait doesn’t die. Cobia do not react nearly as aggressively to a dead bait as a live one. The best way to keep your live baits alive and well is after hooking them place them into a live well or a bucket of saltwater. Make sure that the water stays new inside the bucket and live well so that the live bait is always breathing good water. To Learn more on Live Baits for Cobia and how to hook them Click the Video Below! The proper sight fishing apparel is almost as important as the right Cobia fishing gear. Polarized glasses cut the glare off the water making it so you can spot fish below the surface of the water. We recommend Costa Sun Glasses with an amber lenses. A hat or sun visor can help when sight fishing as well. The hat will keep the sun out of your eyes so you can see the water better and spot fish. Last but not least we recommend using Buff face mask to protect your self from the Sun and saltwater. Click the video below to view what to wear when Sight Fishing Cobia!